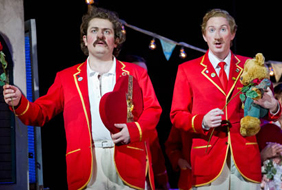 Welsh National Opera return with their seaside production of Mozart’s delectable rom-com. The setting is the seafront of an English resort, with Victorian street lamps along the esplanade. This is a fish and chips. Punch and Judy world, with Italian seasoning. Director Benjamin Davis gets the laughs coming as soon as possible. The effervescent overture underscores a silent movie of seaside life: young lovers walk along the prom, dog walkers struggle to keep their canine charges under control… It sets the tone perfectly for what is to follow. There is much silliness to the plot – the suitors pretend to drink poison and are ‘cured’ by the maid dressed as a mystic with a giant magnet –and the score adds charm and humour to the comic business. The girls’ arias and duets, beautifully sung, show them to be giddy drama queens, melodramatic but heartfelt all the same. But, as with all Mozart, there are moments of absolute beauty too. The farewell to the soldiers, Soave sia il vento, is at once stirring and soothing. It is so gorgeous it makes you ache. 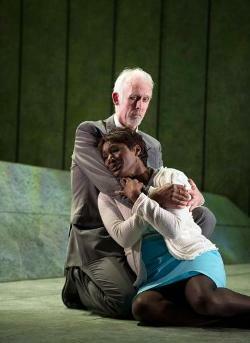 Elizabeth Watts is a petite powerhouse as Fiordiligi, the more serious of the sisters. Maire Flavin is the flibbertigibbet Dorabella – and both are very funny. As the faux holiday reps, Gary Griffiths’s Guglielmo is an absolute hoot in a pair of shorts and Andrew Tortise’s Ferrando has something of the Syd Little about him with his prosthetic nose and buttoned up blazer. Neal Davis dons a chequered Max Miller-type suit as Don Alfonso, engineer of the scheme. A man with a comb-over shouldn’t be able to sing so divinely! He is aided and abetted by chambermaid Despina – Joanne Boag having fun in a range of disguises, able to belt out her opinions while cleaning a toilet. The singing is flawless although I would have liked Ferrando to be a little more forceful in his seduction scene. Mark Wigglesworth’s baton allows for moments of silence, not just to allow for the applause, but as pauses to let the action breathe, as the characters reel from some outburst or turn of events. It is a feast for the eyes and ears – the sweetness of lettered rock tempered with the saltiness of the seaside air. Everything coruscates with wit and there is something of the fruitiness of seaside postcards in the humour. Max Jones’s design is the colourful package of this box of delights, incorporating fairground attractions and life-size Punch and Judy characters whose conflicts complement those of the main characters. There is a cynicism to the piece in its claim (and apparent proof) that all women do the same. The men who put this hypothesis to the test suffer the most, caught in their own trap, but such is the other-worldliness of this little society, it operates solely for the purpose of fulfilling the terms of the bet, you go along with it, as the heart-shaped box of confectionery it really is. Mozart’s music tickles and seduces more effectively than any comedy moustache.